Father Lawrence Lew, OP via Flickr, licensed cc. When looking for brave and courageous young women saints for girls to emulate, one doesn't need to go much farther than the early church. Girls can see the faith and courage of two young mothers, Perpetua and Felicity. The martyrdom of Saint Perpetua and Felicity has been remembered through the ages. These beautiful you women were strong and steadfast in their Christian faith and showed great bravery for the love of Christ. Both chose martyrdom for the love of Christ, even though that meant leaving their beloved babies behind. From a historical perspective, they are important because the written words of Perpetua herself survived to this day as have the accounts of the Christian witnesses who knew her. In fact, the writings of St. Perpetua were so popular with the faithful that they were read at mass for many years. St. Augustine issued a warning that they should not be given as much weight as sacred scripture. Although we can no longer hear the words of St. Perpetua at mass, modern Catholics hear their names at mass whenever the first Eucharistic prayer is said. For ourselves, too, we ask some share in the fellowship of your apostles and martyrs, with John the Baptist, Stephen, Matthias, Barnabas, (Ignatius, Alexander, Marcellinus, Peter, Felicity, Perpetua, Agatha, Lucy, Agnes, Cecilia, Anastasia) and all the saints. Perpetua was a woman of noble birth. At age 22, St. Perpetua converted to Christianity during the time of Septimus' persecution. Her brother converted as well. She had a nursing baby, but there is no mention of her husband and it has been assumed by historians that she was a young widow. Perpetua's father was desperate to change his daughter's mind, because he feared for her well being. One exchange between them is very famous. Perpetua pointed to a water jug and asked her father, "Can you call it by any other name than what it is?" Her father answered of course not, to which Perpetua responded, "Neither can I call myself by any other name than what I am - a Christian." Perpetua was arrested with four other catechumens including two slave, Felicity and Revocatus. Felicity was eight months pregnant. The prisoners were treated cruelly in the stifling heat and overcrowded conditions. Perpetua was able to receive visitors and her baby was allowed to stay with her. She said, "my prison suddenly became a palace for me." Felicity had her own burdens. It was unlawful to execute a pregnant woman, and Felicity was afraid that she would have her baby before her date of execution. When she did go into labor, the guards mocked her. She gave birth to a girl who was adopted by a Christian woman in Carthage. Before they were martyred the women were stripped of their clothing. When the crowd saw that the women had obviously just given birth there was an uproar, and they hastily had to be reclothed. After much suffering, they eventually were put to the sword, along with their companions. Perpetua and Felicity died side by side. Perpetua's last words were to her brother: "Stand fast in the faith and love one another." Sts. 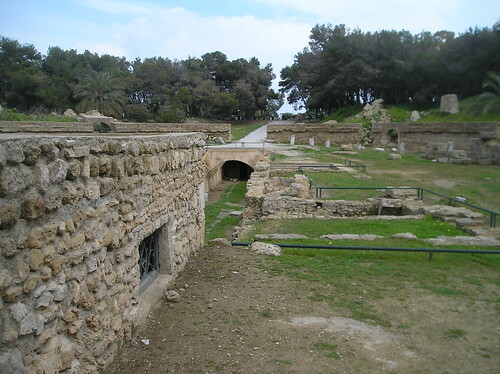 Perpetua and Felicity were mauled by wild beasts and then died by the sword in 203 at Carthage, North Africa. Verity Cridland via flickr, licensed creative commons View from the toms of Sts. 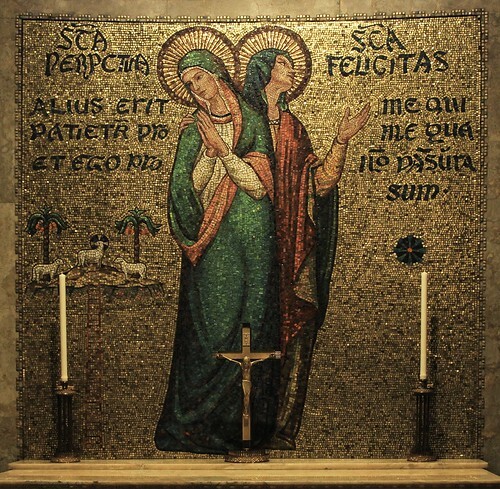 Felicity and Perpetua. My oldest daughters made spoon saints commemorating Sts. 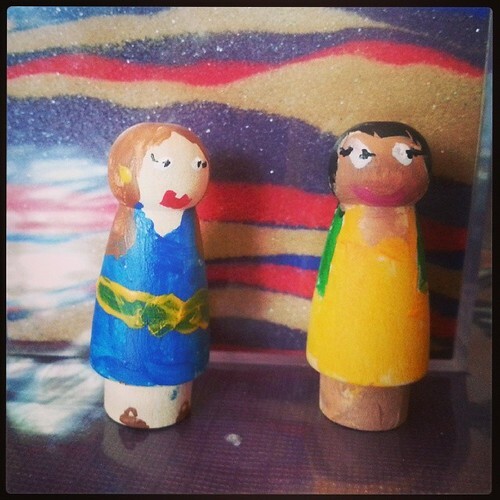 Felicity and Perpetua. 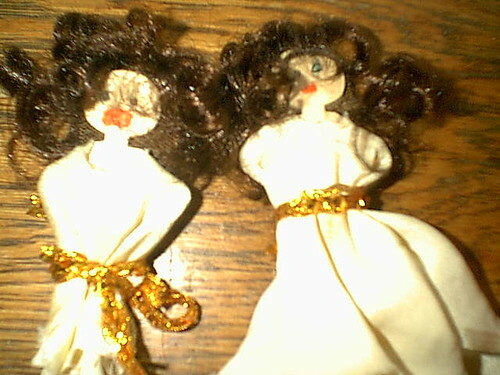 Spoon Saints of Perpetua and Felicity my daughter made a few years ago. My youngest daughter had a devotion to St. Perpetua and wants her as her confirmation saint next year. 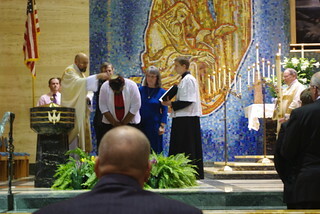 My goddaughter took Felicity as her patron when she came into the church a few years ago. I ordered the story of Perpetua from Catholic Heroes for the Faith. I did watch this with my kids. Rosie, who was 5 at the time, had a hard time with it, but she is always very sensitive when watching shows and movies. It did hold the interest of my older children though and I thought it told the story well. Hi Elena! Thank you for your wonderful words about Felicity and Perpetua! You have a real connection to them through your family members. I remember their names from the mass preface, as they come before my own patron saint, St. Cecilia! Our history is so deep and beautiful, it's great to see you keep us informed in that beauty. Thank you Ceil! I am always amazed at how deep and beautiful our Catholic Faith is. What a treasure! Thanks for stopping by.